All natural stone slabs, just like the natural stone tile, begin their existence as giant pieces of rock that are removed from large quarries and are then cut into slabs. Each slab has its own shape and characteristics. Veining, crystallization, irregular markings, shading are all considered normal aspects of natural stone and add to its authentic look. No two slabs of the same type of stone will look exactly the same. In some slabs you will see markings that may be mistaken for imperfections. 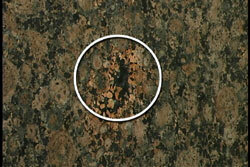 For example, “inclusions”, particularly inherent in granite, are mineral spots that are darker or lighter in color. Fissures, often times mistaken for cracks in the stone, are not. Also, please be aware that the veining direction may not be consistent throughout the slab. These are not defects, but rather a natural part of the beauty of the stone. If the area where you are installing slab requires more than one piece of stone, seaming is necessary. The placement of seams in a slab countertop is dictated by the size of the slabs, density of the stone and the layout of that area. For example, the same type of stone slabs installed in two identical layouts will have different areas of seaming due to the size of the individual slabs. Slabs with more pronounced veining will increase the visibility of the seams. Even after the polishing or honing process at the manufacturers, no natural stone slab will have a perfectly smooth surface. Just like natural stone tile, there may be small chips or pits that are sometimes apparent in different lighting conditions. Different lighting conditions can also cause faint “cloudy spots” to become visible when viewing your countertop or wall from different angles. Granite - Granite is the number one choice for high use areas, such as a kitchen countertop, because it is extremely dense and durable. Marble - Marble is a crystallized limestone that comes in many different color variations and usually displays a veining pattern that adds to its uniqueness. Marble is more porous than granite, therefore popular for bath applications rather than the more heavily used kitchen areas. Limestone/Travertine - Typically, these stones are honed with the matte finish although some of the harder types can be polished. As these stones are even more porous than marble, they may require more preventative maintenance over time. Slabs are solid pieces of stone that are used for countertops, backsplashes, wall and surrounds. More expensive than natural stone tile. Different stone types are better suited for different uses. 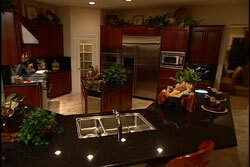 Granite is the most popular slab for kitchen counters for hardness and durability. Seams in slabs are possible and can be visible depending upon the application and layout. You will have a choice of edge treatments for slab. Some edge details are simply the edge of the slab rounded or cut in different styles such as a bullnose, bevel edge, or ogee. The other type is called a laminated edge where there are two pieces of stone laminated together to form more of an overhang. With the laminated edges you will see a seam. It is highly recommended that you seal your stone tile or slab after it is installed to provide additional stain resistance and to protect the stone’s original beauty. There are different types of sealers depending on the type of stone. Scratches, stains, etching and dulling of the surface are all permanent damage and forever alter the appearance of your stone. Ask your design consultant for information about sealing. 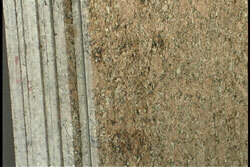 There are several different types of natural stone and each has its own level of porosity. The more porous the stone, the more easily it can stain. Therefore, the more protection you will want to help guard your investment. Depending on your lifestyle, you may want to consider sealing your stone on a regular basis. Sealing will help slow down the staining process. 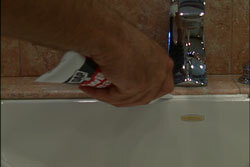 Manufacturers recommend sealing once every one to three years depending on the amount of usage the stone area receives. Your Design Consultant can offer you recommendations about sealing. 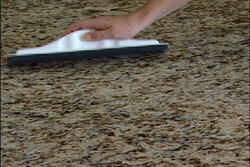 Manufacturers can recommend specialty products designed specifically for their stone countertops. If these are not available you can us a neutral pH detergent or pure soap, such as Liquid Ivory, for spills or periodic cleaning. Make sure to rinse thoroughly and buff dry with a clean soft cloth. Too much cleaner or soap may leave a film and cause streaks. 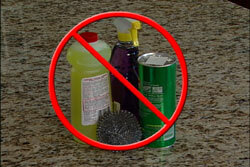 Do not use products that contain vinegar, abrasives or any ammonia-based cleaners, such as Windex. These products will dull the luster of your stone. 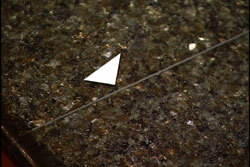 Additionally, do not use retail grout cleaners or bathroom cleaners on your stone. 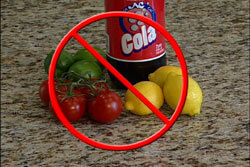 Acidic foods, such as lemons, tomatoes and soda can cause potential damage by changing the color of your stone. Also, protect your stone from oil-based products such as olive oil, cooking oil and oil-based cosmetics which can stain your countertop. If cared for properly and routinely maintained, your new stone countertop and wall tile will bring your household lasting beauty.